Orlando Garage Door Pros has chosen industry leader Chamberlain LiftMaster as its exclusive garage door opener manufacturer. Liftmaster is rated #1 by Consumer Reports! 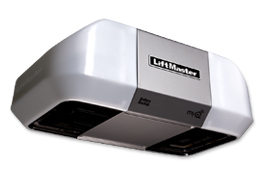 The LiftMaster® 8360 is rugged, reliable, and features an integrated Battery Backup System that ensures your garage door opener, as well as the safety and security features, will continue to work even when the power is out. It is also equipped with built-in MyQ™ technology enabling you to close your garage door or turn lights on or off using a smartphone or computer - from anywhere in the world.